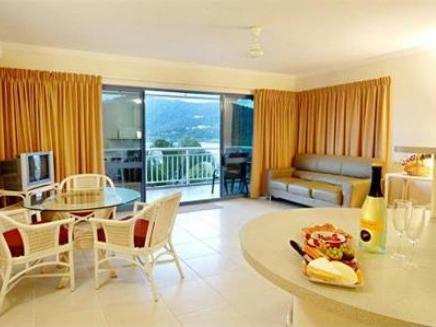 يقع Coral Sea Vista Apartments في شاطئ إيرلي, Whitsunday Islands, هو خيار شائع بين المسافرين. إن موقع الفندق الاستراتيجي، الذي يبعد 2km فقط عن مركز المدينة، يسمح للنزلاء بالوصول سريعاً وبسهولة إلى العديد من الوجهات المحلية المثيرة. يوفر الفندق بفضل موقعة الجيد وصولاً سهلاً إلى أهم معالم المدينة.
. إن Coral Sea Vista Apartments حريص على توفير الراحة للنزلاء، فلا يوفر الموظفون جهداً في تقديم أفضل الخدمات وضمان حسن الاستقبال. يقدم هذا الفندق العديد من الخدمات الكفيلة بإرضاء أكثر الضيوف تطلباً. استمتع بوسائل الراحة الراقية في الغرف أثناء إقامتك هنا. بعض الغرف تتضمن تلفزيون بشاشة مسطحة, اتصال لاسلكي بالإنترنت, غرف لغير المدخنين, مكيف هواء, تدفئة لمساعدتك على استعادة طاقتك بعد يوم طويل. يمكنك الاستمتاع بالأجواء المريحة التي تقدمها حوض استحمام ساخن, حمام سباحة خارجي, سبا, حديقة طوال النهار. إن Coral Sea Vista Apartments هو خيارك لخدمة الفنادق الراقية في Whitsunday Islands. Great location, friendly staff, good facilities. We got to check in earlier as the room was ready which was a blessing after our travels. Our host was so helpful and lovely and welcoming. Would recommend this hotel to anyone. The owner was helpful and knowledgeable with my enquiries. The room was large, clean and comfortable. It was close to our Greyhound stop and the marina (some tours). Several (hot) minutes walk into the main drag, but not too bad (there were some good dining options on the way). The whole area is overpriced for staying options (in my opinion). This was medium pricing, in comparison. Word of warning, don’t pay to go to Whitehaven Beach on a big vessel if a northerly is blowing, you don’t get in! i traveled with my parents in February. And this was the best hotel we have lived. we were so lucky that the room we ordered had been upgraded to a three-bedrooms suit. And the staff Scott provided a warm service which gave us a feel of at home. I would choose the Coral Sea Vista again next time i visit Airlie Beach! For about $450 for three nights we got a room that was quite average. (I get that there was a cyclone and some of the smaller hotels probably can't afford to rebuild as fast as the bigger companies) but that doesn't excuse that the bathroom was a bit dirty on arrival. The bed is not the comfiest BUT a big plus for the hotel is its location. It is only 500 m from the main street and just across the road from the Ferry Terminal (which is the main reason we chose this hotel). Location of apartment is quite a distance away from the main town for those who are not keen to walk. Also, there's a steep slope before reaching the apartment so definitely not for those who have elderly or children with them. For those with heavy luggages, there's not lifts available in the apartment and it's 3 storeys high. Apartment I stayed in had a portion of the floor which was giving off a bad smell due to accumulation of water underneath. The reception is aware of this as this was a result of cyclone Debbie and they will resolve this asap. Very welcoming and helpful couple who are always ready to ensure you have a wonderful time...refreshing! Large rooms with balconies overlooking beach and marina. Excellent value in Airlie Beach. Spacious room, great view, close to the new marina. Stayed in the family apartment, very spacious, great views, very good value. Probably cheaper as it is a bit dated, but clean and very comfortable, highly recommended. 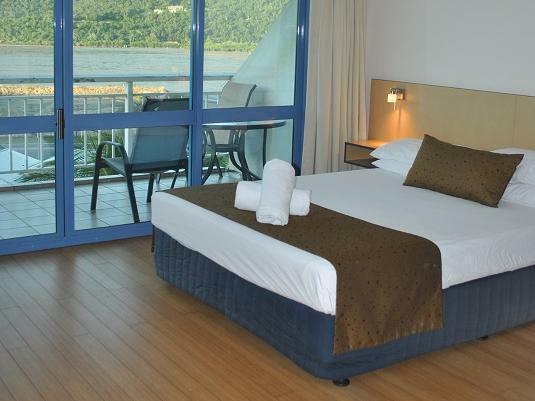 Apartment is only a short walk into town centre and even closer to the ferry terminal. Lovely views from verandah and spacious living area in apartment. We keep going back for more. we had a great stay, however, i would like to make it know, that there is a very very steep driveway to get to receiption, and then stairs all the way to top floor (no lift), so for older people like us, this was quite a challenge. is definitely not suitable for the elderly, or people with young children, it was great to have some snack provided , particularly as it is a hard walk with groceries, if you happen to not have a car. the location is great, right near the arriving ferries. there is plenty to do and is just an easy walk into town. Close proximity to ferry terminal and main street. Plenty of space in apartment for family. The view from balcony was great. Our stay was very comfortable and relaxing. The apartment had everything we needed and we could very easily walk to the ferry terminal and main street when needed. Would highly recommend and definitely come back.